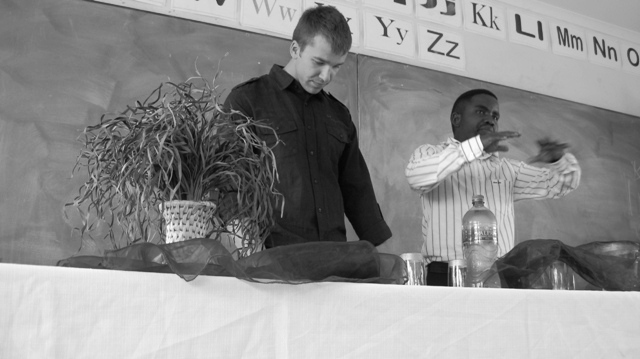 The demonic prosperity gospel has an enormous stronghold here in Africa. I wanted to confront it head-on. 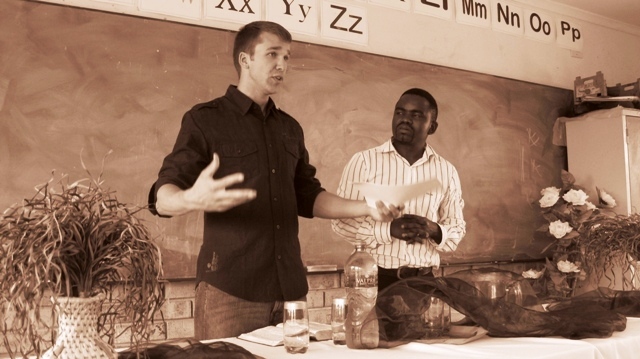 I wanted God to do a mighty work and reveal the true nature of the gospel. I knew that because of what I was going to say, suffering could come my way. While I sat and listened to John’s pre-sermon ‘sermon’ and the loud, keyboard-driven praise music, I prayed that God would come with power to preach boldly — even if the message would be unpopular. I prayed for transformation. And by God’s grace, I think we saw the beginning of transformation by the time we were done. Let me be honest: after the service, I tried to avoid John. But he found me (it wasn’t hard, there were only about 40 people, and more than half were children). He grabbed me and shook my hand and said, “James, you have opened my eyes up to something I didn’t know about. I thought when I have Jesus, the money should flow in. But I realize that I wasn’t believing the real gospel. Your message, it was the real gospel.” I was floored. All I could say to him was, “Praise God.” I gave my manuscript to John, and over lunch, we talked about getting him more resources that will help him be shaped by the real gospel. With this response, God answered my prayer. All week I had been praying that God would open people’s eyes to see. I can’t do that. Yet, that is exactly what God told Paul to do in Acts 26:18, “I am sending you to open their eyes.” How can we do this impossible thing? It is only by God’s grace that he works through us. Anything is possible with him. He is the one who says, “Let light shine!” (2 Cor. 4:6). And he did today. In fact, he’s doing it everyday. 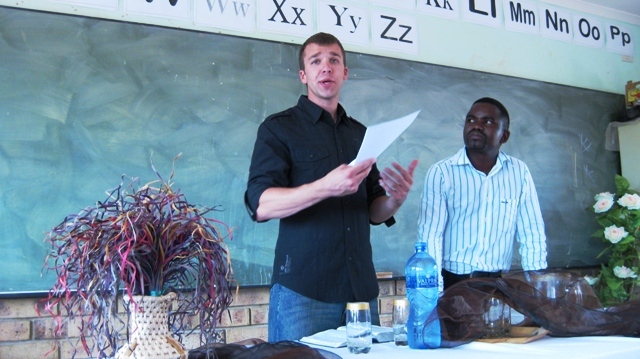 John was just one man, during one service, after one sermon, in one small, sweaty, school room in South Africa. But it’s a testament to God’s grace and power. It’s a testament to his kindness in answering prayer. It’s a testament that he is the one who opens eyes, and that he uses nobodies like me to do it. Thanks to Rylan for the pictures! 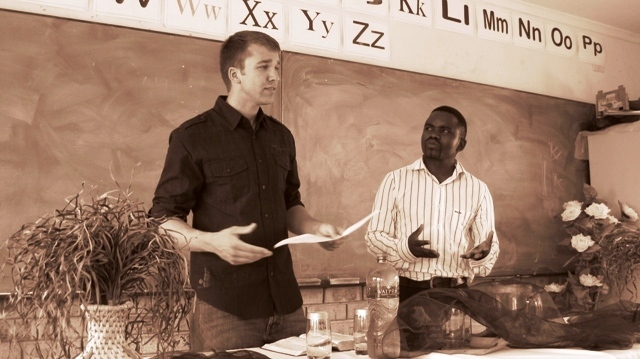 Preaching with a translator is never easy (this was my second time). It’s difficult to get in rhythm because I have to speak very simply (he’s not a professional translator) and sentence-by-sentence. But by the end though, Lordwick and I started to feed off each other. Listen to or read the message. Praise Him — He gets all the glory. James, you are blessing to us all. Despite this failing of mine, I think your sermon was fantastic and I hope the messages in it about constructive responses to suffering reach many people. oops, only quoted text was meant to be italic. Cheryl, I guess I don’t really know what you are asking. Nevertheless, here’s a stab at it. God is unchanging. Hebrews 13:8 says, “Jesus Christ is the same yesterday today and forever.” We believe Jesus is God, because Jesus is God. The Bible teaches that Jesus died to purchase all God’s people, past, present, and future. And he also died and rose to purchase everything good for God’s people, past, present, and future. Everything that happened before Christ’s life on earth was an anticipation and expectation of his coming incarnation. Obviously Job didn’t repent to Jesus by name, but in repenting to and worshiping Yahweh, he was worshiping Jesus. Just one of the examples from Scripture that shows this is true is in John 12:41, John writes, “Isaiah said these things because he saw his glory and spoke of him.” The “he” is Jesus. In Isaiah 6, when Isaiah says, “Holy, Holy, Holy is the Lord God Almighty, the whole earth is full of his glory,” he saw a Person. He saw Jesus. Maybe that helps. Maybe it confuses you more. haha. Let me know. Are you saying that the resurrection functions retroactively? OK, I think what I’m really asking is: what, specifically, can God do post-resurrection that God could not do pre-resurrection? In one sense, yes, Christ’s resurrection functions retroactively because the salvation and benefits of OT saints were grounded in the future promise of Jesus, for history centers on Jesus Christ. The OT saints didn’t know Jesus by name, but they simply looked forward to the fact that the Messiah would come and redeem God’s people. Paul says, “It is those of faith who are the sons of Abraham. And the Scripture, foreseeing that God would justify the Gentiles by faith, preached the gospel beforehand to Abraham, saying, ‘In you shall all the nations be blessed'” (Gal. 3:7-8). So whoever has faith in God are the true sons of God. As for your second question, I would tell you to read the NT book of Hebrews. That book was written to show that Christ is better than the Jewish law and is superior to Moses, the prophets, and angels. No doubt OT saints were as saved as Paul, Peter, John, and me, however, they weren’t able to see and know and experience New Covenant promises, such as knowing the person and work of Jesus, having an indwelling of the Holy Spirit, and freedom from the Mosaic law. Those are just three, probably among thousands. But I would need more time to think about this. Which might be hard because my time is wrapping up here in South Africa and so I’m fairly busy in the next two weeks! What a great example of the reasons to just preach the truth! Praise God that John was open to correction. Blessings to you for confronting the false prosperity Gospel. Vigilence of sound doctrine is vital: Look how many false teachings in the church Paul had to correct just 20 years after the resurrection!